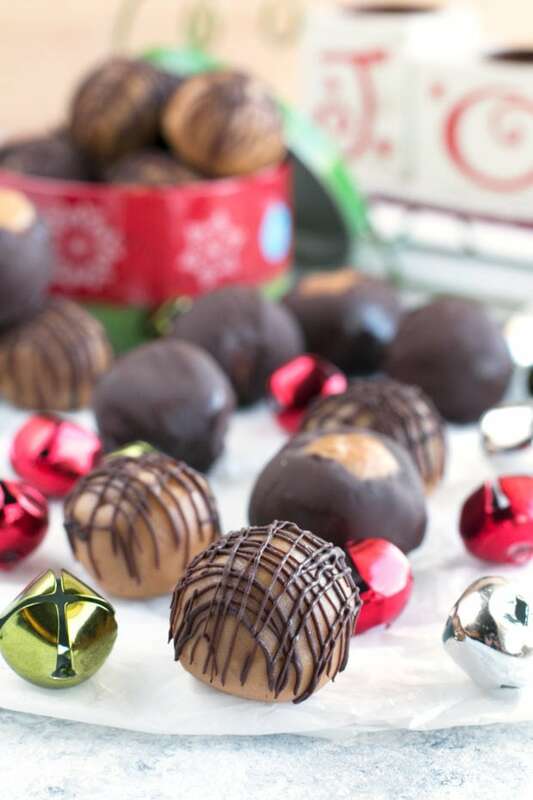 Crispy Bourbon Buckeyes are a boozy chocolate and peanut butter treat that are perfect for handing out to friends and family this holiday season. 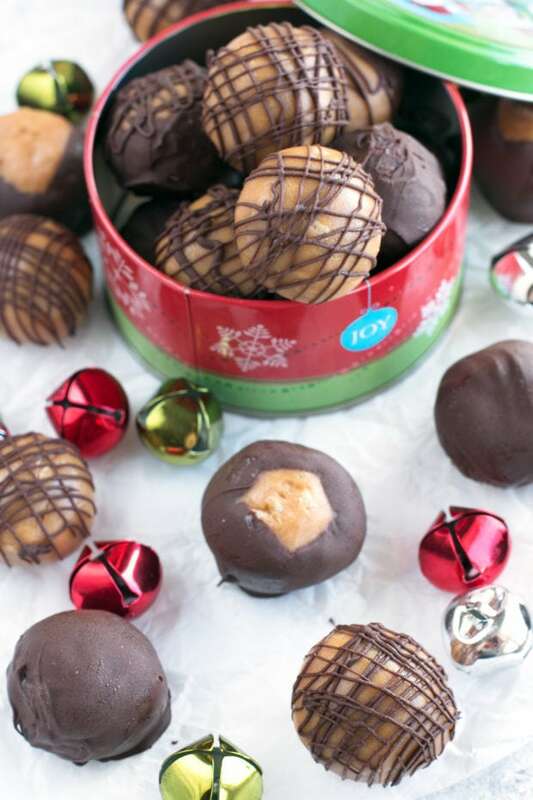 The crispy rice cereal in these balls gives them a fun texture and the bourbon pairs oh-so well with the goodness that is chocolate and peanut butter. 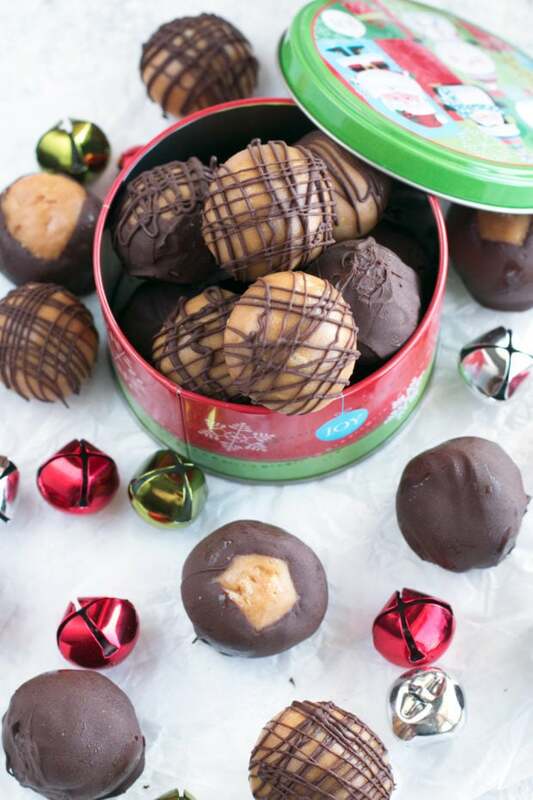 They are SO simple to make; you won’t find an easier Christmas cookie to make! Thanksgiving is wrapped up, and while you may still be working through all those leftovers… The holiday baking season has begun! I have some amazing treats coming your way this month (not only for the 12 Days of Jolly Giveaways) and these cookies are kicking it all off. 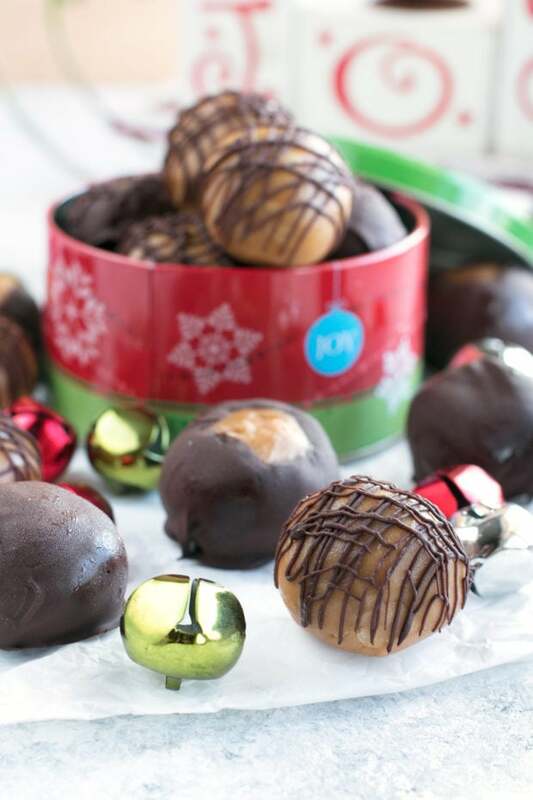 Now I know these are technically no-bake, but that doesn’t make them any less delicious and PERFECT for gifting to friends and family during the holiday season! She added Rice Krispies cereal! It might seem odd but I LOVE the texture that the little puffed rice pieces bring to the party. They stay crunchy in the balls and they give your tastebuds a little break from the rich and indulgent peanut butter and chocolate combination. Of course, I had to put my own boozy spin on the whole thing, so I added bourbon. Bourbon makes everything better, am I right? These are the best “adult” cookie ever. They are booze, they are rich and they are full of flavor. 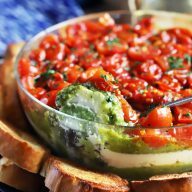 Pairing one with your after dinner coffee or even after dinner cocktail is an amazing treat any night of the year. I am SUPER excited to share with you all these cookies because they are more than just amazing cookies… They are cookies that were made for a great cause! 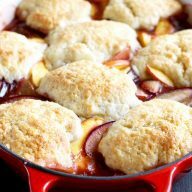 This week I am going my fellow blogging friends from all over the internet in a joint effort to raise money for Cookies for Kids’ Cancer! It all started when 2-year-old Liam Witt was diagnosed with childhood cancer in 2007. His parents Larry and Gretchen were shocked to learn of the lack of effective treatments for pediatric cancers due to lack of funding. They pledged to support the funding of research for safer, more effective treatments for children battling cancer. With the help of 250 volunteers, his mom Gretchen baked and sold 96,000 cookies, raising more than $400,000 for research. Word spread, and people nationwide began asking, “How can I help?” From that giant cookie bake, Cookies for Kids’ Cancer was born. Since cancer is the #1 cause of death by disease of children in the U.S., it’s time to come together and help this amazing non-profit succeed! We started our fundraising with a bake sale (all the bloggers participating have donated! ), but you can do ANYTHING to fund pediatric cancer research. Whether it’s a bake sale, sports challenge, penny drive, swim-a-thon, flag football tournament, 5K sponsorship, cookie swap, or anything else, any amount raised can give hope to kids battling cancer. You can donate by clicking here and visiting the Cookies for Kids’ Cancer website! 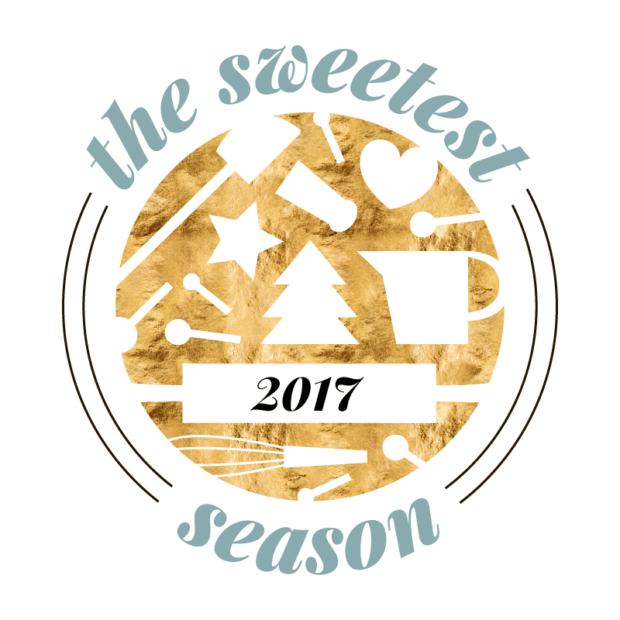 Keep an eye out for the #sweetestseasoncookies hashtag all week to see all the cookie goodness from all my blogger friends this week! Happy holidays friends! 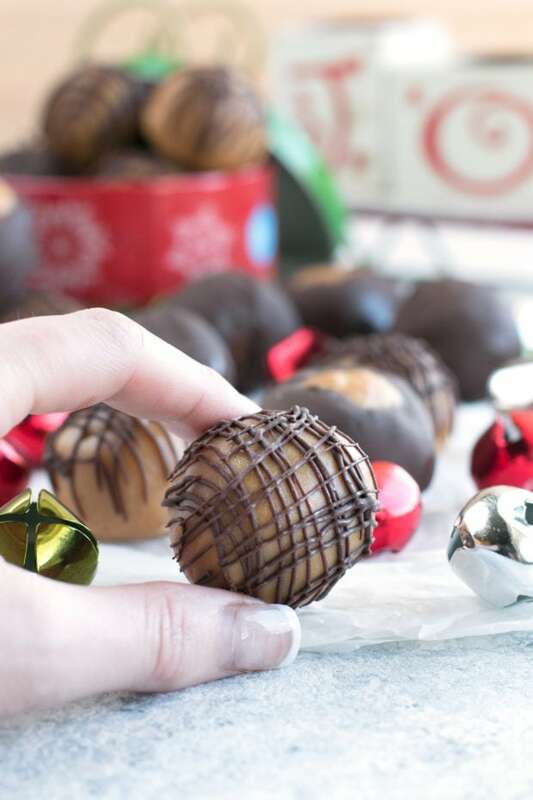 Pin this Crispy Bourbon Buckeyes recipe for later! 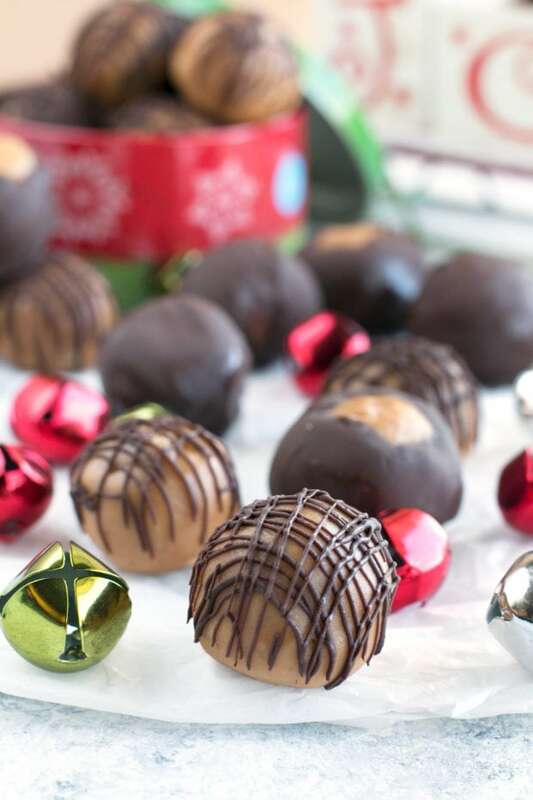 Traditional buckeyes are taken up a notch with the addition of crispy cereal and bourbon! 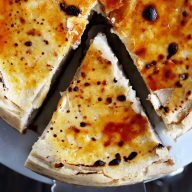 In the bowl of a stand mixer, add confectioners' sugar, peanut butter, butter, vanilla, bourbon and salt. Mix together with the paddle attachment until smooth, approximately 1 minute. Fold in Rice Krispies. Portion out the peanut butter mixture into 1 Tbsp balls. Roll the balls into circles with your palms. Add to the lined baking sheet, cover with plastic wrap and chill in the freezer until firm, approximately 30 minutes. Before the balls are done chilling, melt the chocolate. In a small microwave-safe bowl, melt chocolate in 15 second increments, stirring in between until the chocolate is melted. 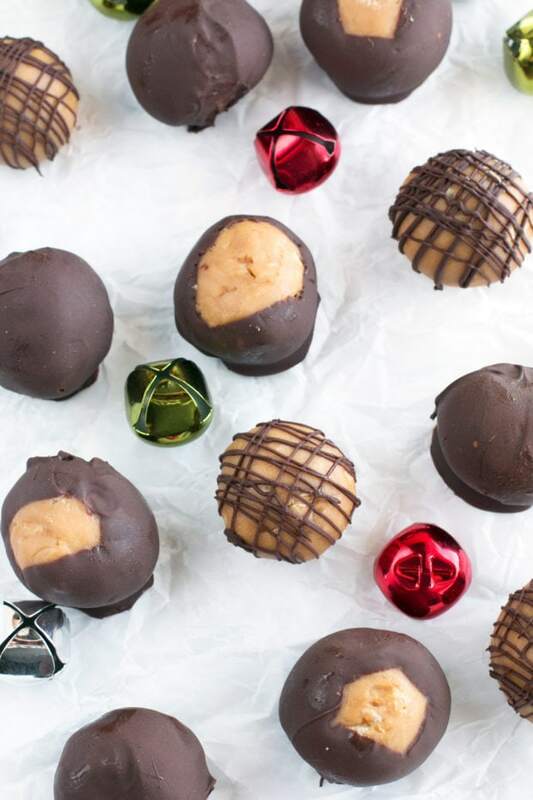 Coat the buckeyes to your liking, whether covering them completely, dipping to coat 3/4 of each, or drizzling chocolate on top. 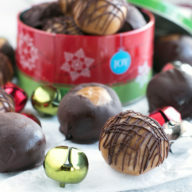 Once finished coating the buckeyes, add them to the refrigerator until the chocolate is set, approximately 30 minutes.